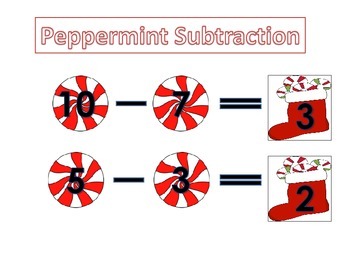 In this activity students have to subtract the numbers on the peppermint and find the answer on the matching stocking. 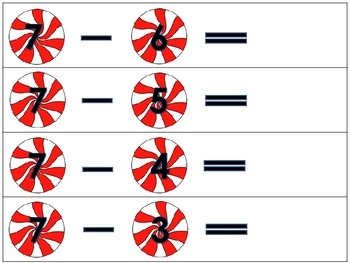 This is a great activity for a math center or finished work activity. 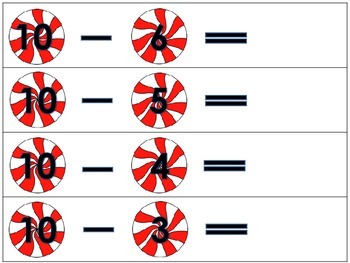 Use this in your classroom to build fluency for subtraction to 10. Print on card stock and laminate for durability. Write the answers on the back of the peppermint cards for self checking. Great to use with whiteboards so students can show their work. Great for high level Kindergarteners or low level first graders! 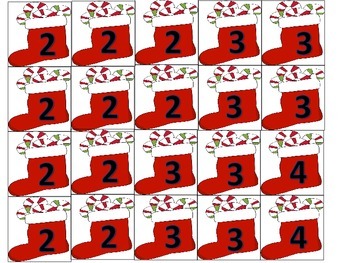 FUN holiday themed math activity! This is apart of our Christmas themed math and literacy center unit. Please do not repurchase if you have already purchased the unit.